Adding contacts who complete a Typeform embedded in your website to a flow. 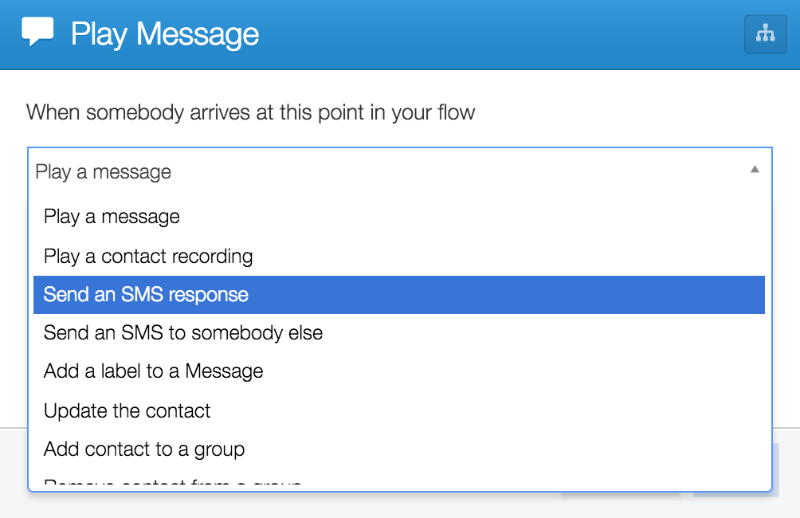 Adding new Salesforce contacts to flows. Using HookPress to trigger flows from actions taken on your Wordpress site. 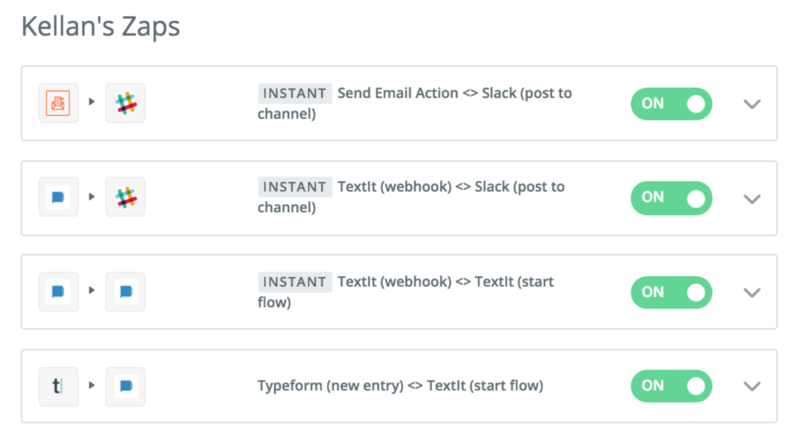 Learn how to automatically start a flow using information collected by a new Typeform entry. 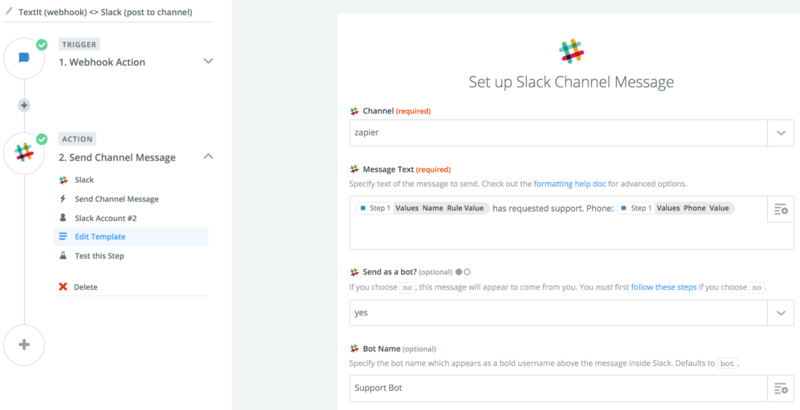 Learn how to automatically post information collected by a flow to one of your team's Slack channels. Check out Zapier to discover more use cases and sign up for a free account if you haven't already. 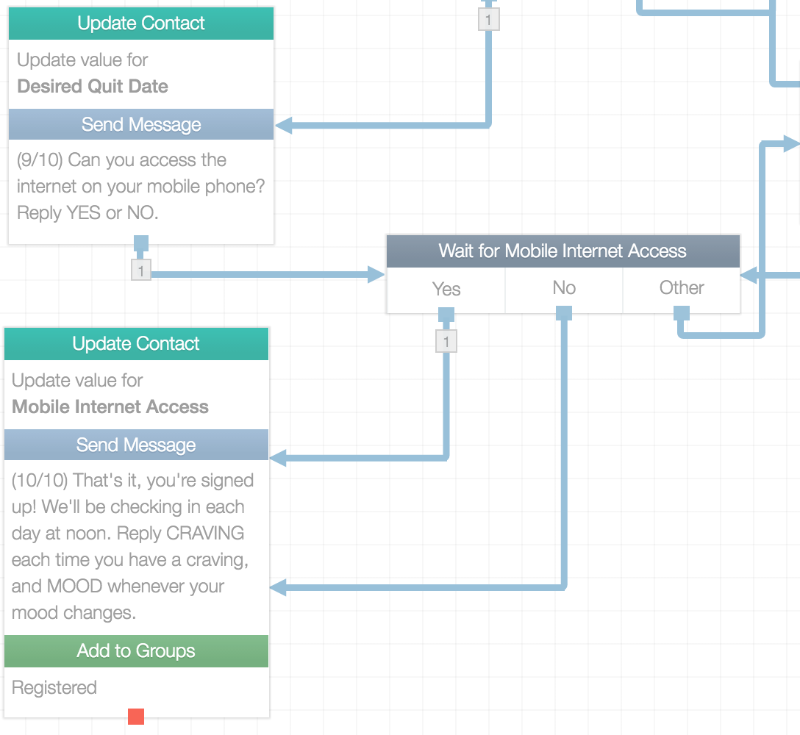 Have a workflow you need to automate that you don't see here? Let us know, we'd love to get your feedback! We shipped some changes that will populate incoming MMS messages with the URL of the media sent via MMS. 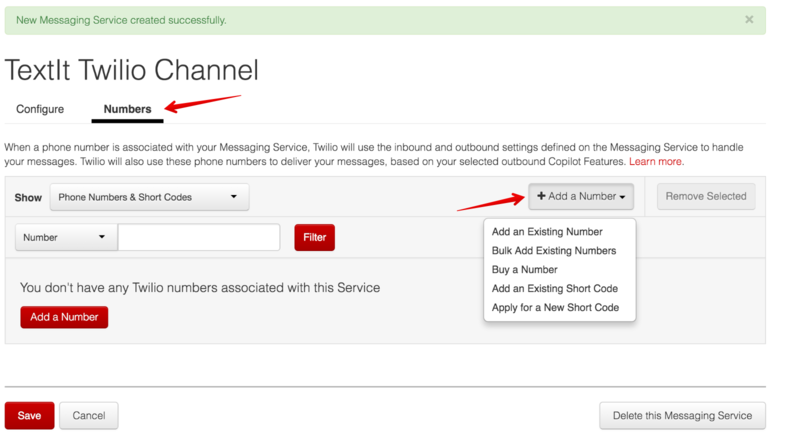 This may be particularly useful for those using Twilio channels. Those looking for a reliable aggregator in Indonesia may consider Dart Media or Text Magic. We're happy to facilitate integration; contact us to learn more about the process. Download the flow Time Conversion to learn how you can convert TextIt's default 24 hour time values to 12 hour time values. You can delete contacts in bulk by placing the contacts whom you'd like to delete in a group via a flow, then using the API Explorer (specifically, the 'Delete Contacts' request) to delete all contacts in that group. This will delete each contact's history as well. Twilio, our recommended SMS and voice channel in most countries, recently optimized its platform to accommodate programmatic SMS messaging at scale. Learn how you can take advantage of this exciting new feature (link). The Kapita Community Savings and Investment Promotion cooperative (COMSIP), a Malawi-based public works project funded by the World Bank Groupe, uses TextIt to registar prospective participants and accept monthly financial reports (link). 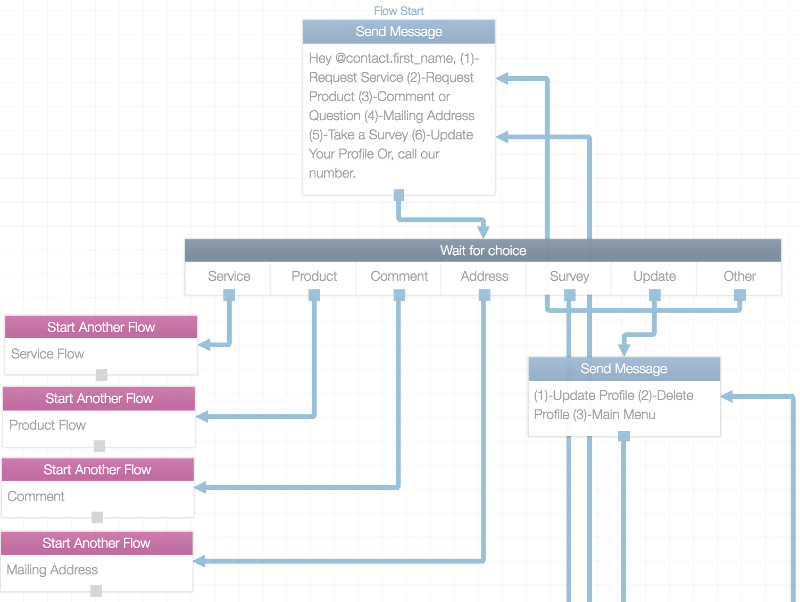 Our friends at UNICEF are compiling a Flow Repository comprising flows for various aid and development use cases. Add them to your account to see what's possible (link). Those sending messages via a Twilio channel should be aware of Twilio's keyword recognition system. Check out this article for suggestions on how to track opt-outs and segment them appropriately (link). If you're using Google Chrome, make sure to update your version before logging-in to your TextIt account (link). Current version is 49.0.2623.95 (Platform version: 7834.60.0). Our friends at UNICEF published an insightful tutorial on merging contact and flow exports (link). Twilio, our recommended SMS and voice channel in most countries, recently optimized its platform to accommodate programmatic SMS messaging at scale. This upgrade allows for the creation of a messaging service, which enables you to dedicate multiple local Twilio numbers to a single TextIt channel, and improve SMS delivery with phone number intelligence via the new Copilot features available in your Account Portal. Twilio's Geo-Match and Sticky-Sender features ensure that the relationships between your phone numbers and contacts remain constant from your first broadcast. When multiple channels of the same type are connected to your TextIt account, the channel that the contact last messaged will be prioritized. Contacts can be locked-in to a relationship with a specific channel (they'll only received messages from this channel). Geo-Match and Sticky-Sender ensure that even if your contact sends a message to the wrong channel, they'll always receive a response from the same number. Dynamic Encoding - character encoding is dynamically adjusted per carrier so that double-byte characters and even Emoji are delivered as intended. Outbound Message Concatenation - long outbound messages are automatically segmented and encoded for re-assembly to meet destination carrier requirements. You're ready to start sending messages. 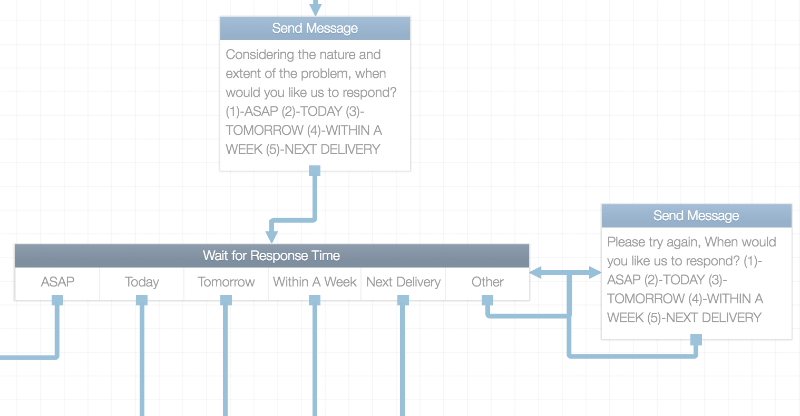 Start a flow to test out your service. Poverty (those living on under $2/day). Access to affordable business loans. Low female participation in development decisions. Low levels of female entrepreneurship. Lack of collaboration for collective bargaining. High levels of energy poverty. High dependency on GMO seeds and inorganic fertilizers. Until recently, the community of Kapita, Malawi, didn't have access to financial services within a 60km radius. COMSIP, a cooperative bank, was established to enable members of this community and others to purchase shares and take up to 3 times the value of their investment as a loan for agricultural or business purposes. 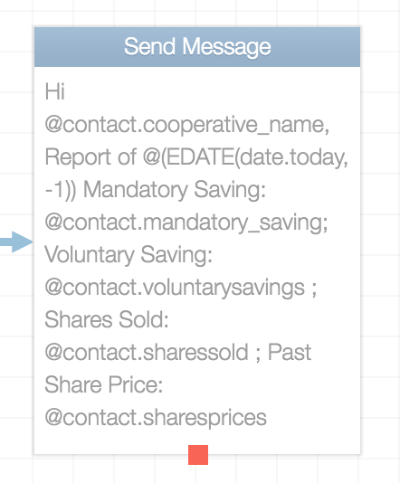 Using TextIt, COMSIP built a flow that allows prospective participants to both register for COMSIP and submit monthly financial reports via SMS. the number of males and females in the registrant's cooperative. the registrant's cooperative's share price. The flow then provides a password corresponding to the respondents language preference, Chichewa or English. The registrant's information is then sent to COMSIP coordinators via a Send Email action. Click here to learn more about registration flows, and here to learn how to use flows to provision and evaluate passwords. Respondents can initiate the reporting flow with the keyword 'COMSIP'. Once the flow starrts, they're asked to enter the code they were provided by the registration flow. If they don't have one, they're routed to the registration flow by a Start Another Flow action. mandatory savings for the reporting month. voluntary savings for the reporting month. total shares sold in the reporting month. loans taken in the reporting month. total investment in the reporting month, and where. profit made during reporting month. products produced during reporting month. Each valid response is then saved to the contact's profile and, at the end of the flow, sent to COMSIP coordinators via a Send Email action. Respondents who elect to submit feedback are asked to provide a qualitative response, which is then sent to COMSIP coordinators via a Send Email action. COMSIP coordinators receive the respondent's contact information and feedback. the establishment of a democratically-run, registered cooperative. the training and certification of over 180 people in business skills. 200 households have gained access to solar home lighting, cutting costs on kerosene through energy loans that have high repayment rates. over 25 enterprises have received a business loan. the design and incorporation of a mobile credit system to expand COMSIP's capital base for loans. over 40 shareholders and growing. Did you know that TextIt can be used to build applications capable of managing an entire organization’s customer-facing communication channels? A. Barr Simpson (A. Barr), a company that installs, services and maintains fountain soda & mixed gas products, has done just that. From customer registration to service requests, A. Barr’s TextIt application handles all customer-facing communication, providing targeted information and distributing requests where appropriate. No customer goes unanswered, and their requests are immediately processed. Best of all, they do so without integration; each flow utilizes TextIt's core features. provide A. Barr's mailing address and contact information via a keyword. provide a menu that directs customers to the flow that meets their need: signing-up, putting through a product or service request, submitting a question or comment, requesting A. Barr's mailing address, and updating the customer's profile. register up to 4 businesses for each customer. process product orders and schedule deliveries. process service requests and schedule appointments. provide delivery notifications one day prior to delivery. process customer questions and comments. provide targeted instructions after a particular products are delivered. As organizations like A. Barr have found, menus are essential to automated messaging and voice applications. Simply build your menu and use the Start Another Flow action to link each category to the appropriate flow. A menu might be triggered by a specific keyword, which can be assigned to a particular group or open to all contacts, or an uncaught message trigger, which starts a flow for any contact who sends a message not handled by a keyword you've already created. It's also a great way to account for miscellaneous messages. A. Barr uses an uncaught message trigger to direct contacts to the menu flow and alert an employee of the inquiry. 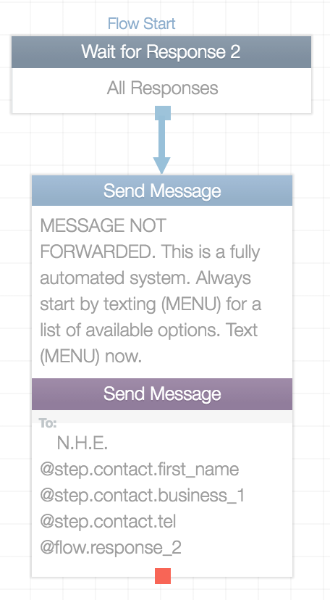 A. Barr uses the Send Message to Someone Else and Send Email actions to send product and service requests to employees. Values such as the service request and request time are collected from either flow, then to employees using flow variables. A. Barr uses a simple RuleSet to understand the severity of the problem. This information is then used to determine response time (ASAP, today, tomorrow, within a week, or during the customer's next scheduled delivery). An employee is alerted of the request and its severity via text message, allowing them to immediately contact the customer. Onboarding your contacts is important when introducing a TextIt app that supplements or even replaces one of your organization's communication channels. For this reason, A. Barr has set up a campaign containing a single-message flow that follows up with new customers after they've completed their first interaction to remind them of what they can accomplish via the the application. This week, we're highlighting a use case backed by a substantial body of research: smoking cessation. It's been found by study after study that advice, reminders and tips sent via text message are just as effective as phone counseling and nicotine replacement therapies. In fact, this meta-analysis of 13 smoking cessation studies found that on average, quit rates for text messaging intervention groups were 36% higher compared to control group quit rates. Sample flow available to download (link). 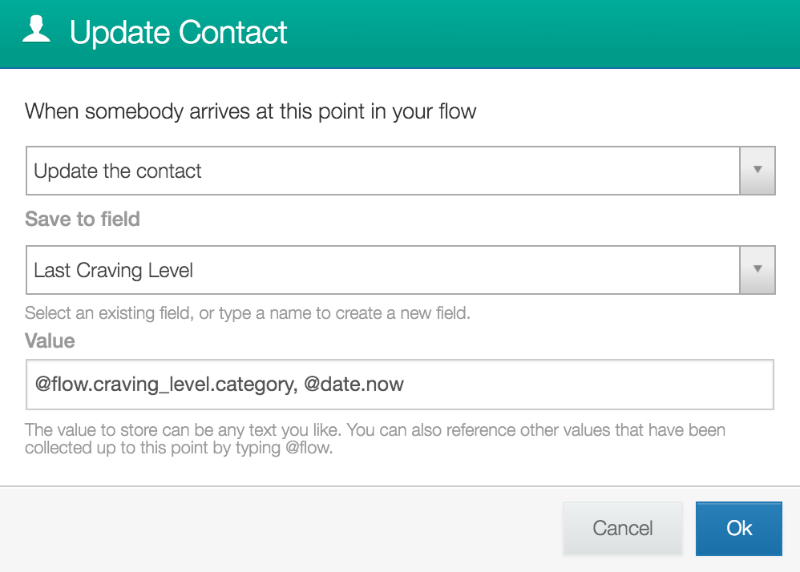 Learn how you can use flows to automatically create and populate an entire profile for each new contact. In tandem with our use case spotlight, we're demoing an SMS version of the SmokefreeTXT online registration form. SmokefreeTXT a mobile-based smoking cessation intervention designed for teens and adults across the United States. Sample flow and the QuitNowTXT smoking cessation message library are available to download (link). We've created some Telegram chat bots to demonstrate what's possible with a TextIt/Telegram integration. Search for Purrington, a bot that provides cat facts, and Oxford Wordsly, a bot that tests your English and Spanish vocabulary, to try it out. 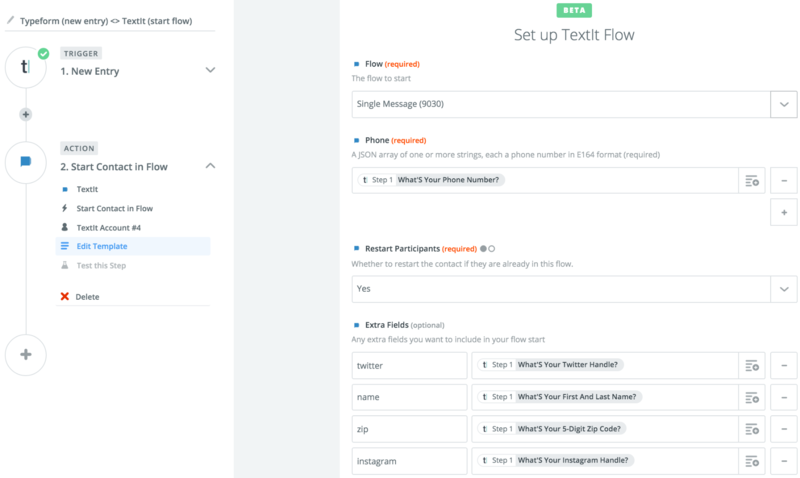 Those who'd like to track each contact's progress within a flow, or completion thereof, can use Update Contact actions to do so. Import the 'progress-tracking.json' flow below to learn how. Notes are included to help you along. It's possible to search for contacts based on the value of a custom field. Just plug a query into the search bar of your contacts tab, e.g. age>=21. Learn more here. 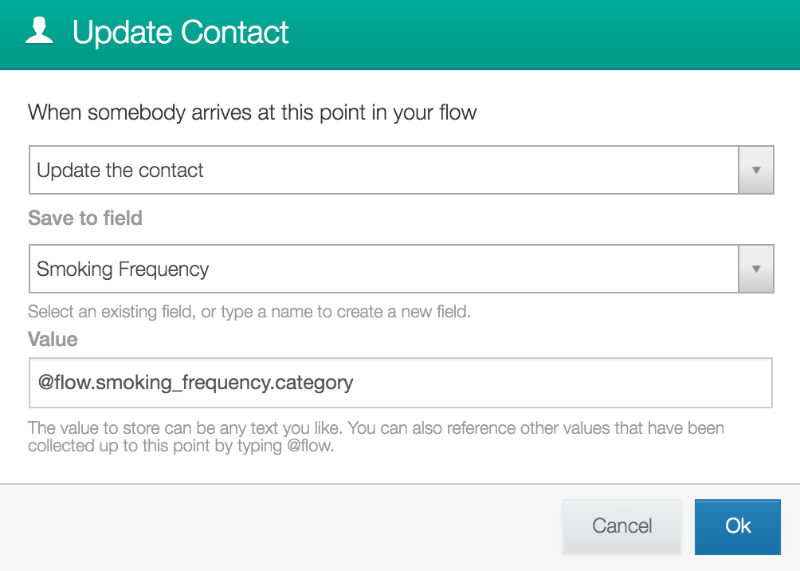 Did you know that you can use flows to automatically create and populate an entire profile for each new contact? Some of our largest deployments rely on registration flows to manage both new and returning contacts. They allow apps that are consistently adding contacts via a keyword trigger to scale with ease. 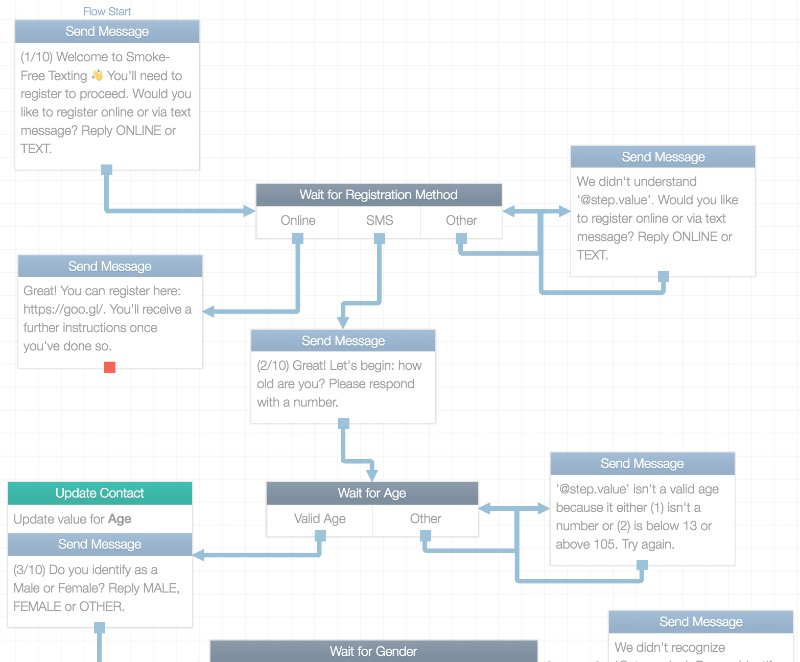 This week, in tandem with our use case spotlight, we're demoing an SMS version of the SmokefreeTXT online registration form. SmokefreeTXT a mobile-based smoking cessation intervention designed for teens and adults across the United States. It was developed with support from the U.S. Department of Health and Human Services, National Institutes of Health, National Cancer Institute, and USA.gov. The easiest and most powerful components of an effective SMS-based registration form are the Update Contact and Add to Group actions. 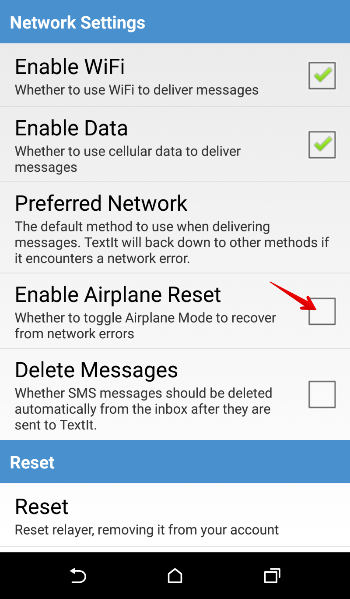 This action is essential to successfully registering a contact within your TextIt app. It allows you to add pertinent information you've collected from a contact to their profile as a contact field. For example, an app adapting the QuitNowTXT programming might want to add a contact's smoking frequency. First, you'd need to create a RuleSet containing simple response rules that evaluate for each contact's smoking frequency and categorize it accordingly. The RuleSet above will produce the flow variable @flow.smoking_frequency (the same value placed in the "Save result as" input). 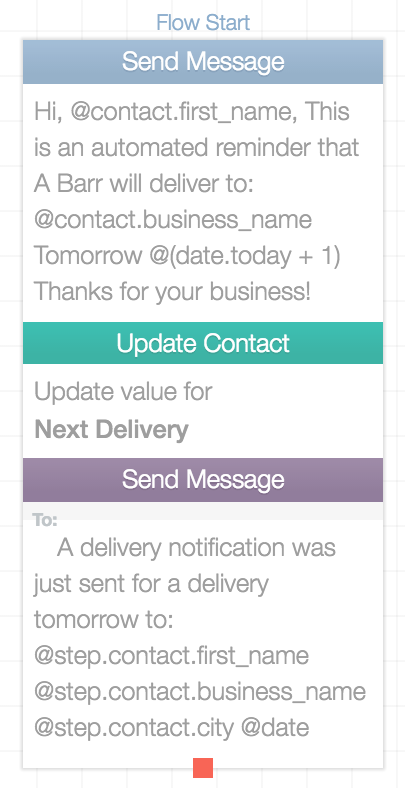 Flow variables are then placed in Update Contact actions to be stored in a contact field on the contact's profile. 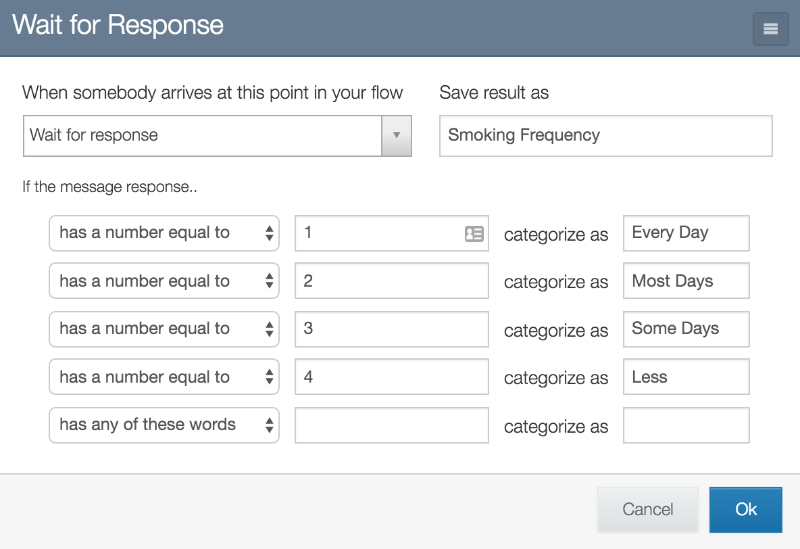 @flow.smoking_frequency.category allows us to reference the category the contact's response was placed in. Once the contact passes through this step, their response will be displayed as an attribute that can be referenced using contact variables. This action can be used to segment contacts based on their responses, response frequency, completion of a flow, and much more. In this case, we're using it to group each contact who has completed the registration flow. This week, we're highlighting a use case backed by a substantial body of research: smoking cessation. It's been found by study after study that advice, reminders and tips sent via text message are just as effective as phone counseling and nicotine replacement therapies. In fact, this meta-analysis of 13 smoking cessation studies, published in the Journal of Substance Abuse Treatment, found that on average, quit rates for text messaging intervention groups were 36% higher compared to control group quit rates. These results are significant given the wide reach and low cost of SMS programs built and deployed with TextIt. The finding that 'text-plus' programs (e.g., text messaging plus web or in-person intervention methods) performed only slightly better than 'text-only' programs is particularly compelling, as it indicates that cost-saving measures may not affect efficacy. Results also indicated that message frequency affects quit rates, as fixed schedules performed better than decreasing or variable schedules. This finding falls in line with our own, which influenced the design of TextIt's campaign feature. One of the core tenets of TextIt is to enable the kinds of interactions that have been proven to work most effectively. Most of the SMS-based smoking cessation therapies evaluated by Spohr SA et al used message broadcasts rather than two-way messaging. TextIt supports both approaches to accommodate a variety of programs. Craving Level - measured in terms of intensity, e.g. "High, Medium and Low"
Mood Status - measured in terms of quality, e.g. 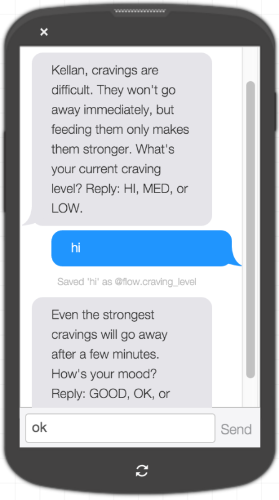 "Good, Okay, Bad"
Once a participant indicates their craving level, for example, they receive a message tailored to the intensity they indicated. Each time a contact responds, TextIt's Update the Contact actions replace the value the category their response matched (High, Medium or Low; the responses 'High', 'Hi', or 'H' would match the 'High' category, for example) as well as the date and time. Those that would like to track the amount of times a contact responds may use the longitudinal approach explained here. 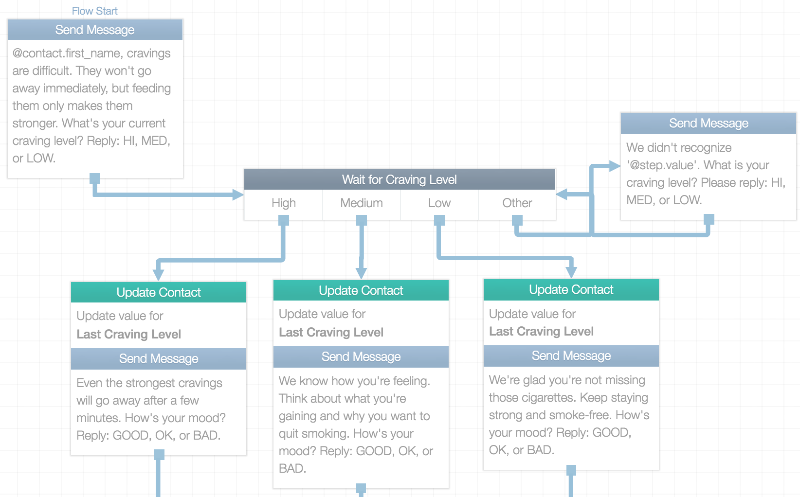 Those who are sending flows on a schedule via a campaign may wish to create a separate flow for each checkup, each containing a set of contact fields unique to that day, so that they can see how responses change over time. [+] We published an article highlighting the City of Boston's Boston Centers for Youth & Families Division of Youth Engagement and Employment's use of TextIt to to power the SMS messaging portion of its communication pipeline. It’s the largest youth employer in Boston, hiring over 4,000 youth annually to work with over 200 community-based organizations, and has been awarded prizes by the Guangzhou Institute for Urban Innovation and US Conference of Mayors for its work participatory budgeting program, Youth Lead the Change (link). [+] We published an article highlighting WebHelp's use of TextIt to collect product and customer service feedback via SMS messaging for leading European countries. A flow modeled after their service is included for download (link). @(DATEDIF("start_date", "end_date", "units")) calculates the number of days, months or years between two dates. Units are abbreviated "D", "M", and "Y". A valid expression would adhere to the following format: @(DATEDIF("02-26-2015", "02-26-2016", "M")). Flow and contact variables containing date values may replace "start_date" and "end_date". @(DAYS("end_date", "start_date") returns the number of days between two dates. A valid expression would adhere to the following format: @(DAYS("02-28-2016", "02-28-2015")). Flow and contact variables containing date values may replace "end_date" and "start_date". [+] We recently received an inquiry as to how TextIt can be configured to allow contacts to update their own campaign events. Recall that campaigns allow you to schedule messages and flows around a specific date, such as a registration or purchase date. This account will be deploying voice (IVR) surveys in Northern Nigeria each Monday, Wednesday and Friday, and wanted to know how flows can be used to allow their contacts to change the time at which they'll receive their next call (in case their schedule changes). This is an advanced use case, but easy to learn. Import the file below, 'updating_campaign_events.json', into your account to see how it works. Notes are included to help you along. [+] To translate messages sent by campaign events, use them to send flows containing translated messages instead of message broadcasts. [+] We've received a few inquiries from users who wish to protect their applications with passwords. Import the 'code_validation.json' flow below into your account to learn how to generate passwords and validate them. Note that the attached example generates passwords that are only good for one use. Get in touch if you'd like to learn how to apply your own restrictions to your application. [+] Recall that contacts lock into an exclusive relationship with a channel of a particular type once they contact it. This means that if you have multiple channels of the same type connected to your account (such as virtual phone numbers) your contacts will only receive messages from the channel they last contacted. Once they send a message to a different channel, they'll be locked into an exclusive relationship with that channel. Import the file below, 'surface_channels.json', and place contacts in it to create a 'Channel' contact field that contains the address of the channel they last contacted.